I recently discovered the bulk bins at Whole Foods. I’d heard talk of them, but must have always walked past them. It was probably one of those things where I saw them out of the corner of my eye at some point and assumed that they were all just full of nuts and granola, completely missing the ones full of beans and rice and quinoa. Silly me. When I did finally decide to seek them out, I first checked the Whole Foods in Union Square. To be honest, I don’t much care for this store and try to avoid it whenever possible. As a result, I don’t have a good idea of where everything is located. If I went all the time, though, I can’t say that I’d know it much better. It’s constantly crowded, poorly laid out, and not easily navigable. I always feel claustrophobic and overwhelmed, which is why, if they exist, I may have missed the bulk bins both times that I walked around the entire store specifically searching for them. So, as far as I can tell, they don’t exist at that location. Please let me know if I’m wrong. My Whole Foods of choice is the one located on Houston. It’s a bit more of a hike, but the store is spacious and very cleanly laid out. It’s rarely crowded, which means that I can spend as many hours as I want strolling lazily through the aisles and standing like a goon and staring at all the options in front of me. I was quickly able to find the bulk bins at this store once I decided to look for them. As an avid lover of legumes and grains, I found the bulk bins were at once exciting and dangerous. You mean I just push this here and I can fill up this bag as much as I want? I felt like a kid in a candy store. One of those candy stores with all the bulk bins. Except you can’t really sneak a taste out of these bins—your teeth wouldn’t like you much for it. Luckily Chris was there to rein me in a bit, so we only brought home a few bags of dried beans instead of the dozens I might have otherwise come away with. Among them were chickpeas. I immediately had thoughts of stewing them with tomatoes and smoked paprika, creating something simultaneously light and hearty, deep with flavor. A few days later I found some spinach at the market that looked particularly good, some pretty little shallots, and I decided it was time. The ingredients melded together, simmering into a lightly spicy stew. It would be perfectly tasty in a bowl on it’s own or served over quinoa or rice, but I ladled ours over lemon caper millet. The bright and tangy flavors of the lemon and capers are right at home with the smokiness of the paprika, and together it is perfect for the season—zesty enough for the summer ahead but warm and filling enough to dig into on a stormy spring night. And, might I suggest, a darn good reason to track down those bulk bins for yourself. Heat a tablespoon of olive oil in a large pot over medium heat. Add the shallot and cook until soft and translucent. Add the garlic, cooking 1-2 minutes until fragrant. Stir in the tomato paste, smoked paprika, and the wine. Allow the wine to cook off for 2-3 minutes and then add the spinach. Once the spinach is wilted and bright green, coarsely crush the tomatoes in by hand, removing any skin as well as the hard stem ends. Add the juice of the tomatoes, the water (if using dried beans), and the chickpeas. 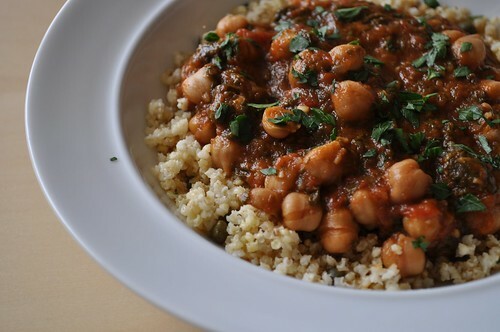 If you are using dried chickpeas, bring the mixture up to a boil for 5 minutes, cover, and reduce the heat medium low. 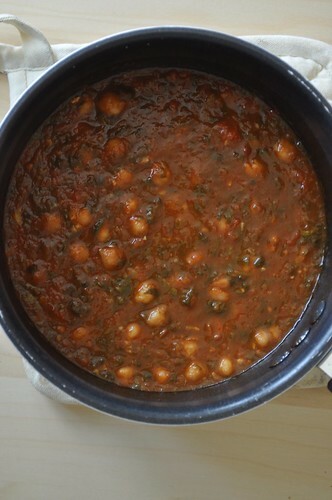 Allow the stew to simmer for 1 hour and then test the chickpeas for doneness. The stew will need to simmer for 1 ½ to 3 hours depending on your beans. Once the chickpeas are tender to your liking—I prefer them cooked past the point of crunchy, but still firm—taste and season with salt if necessary. 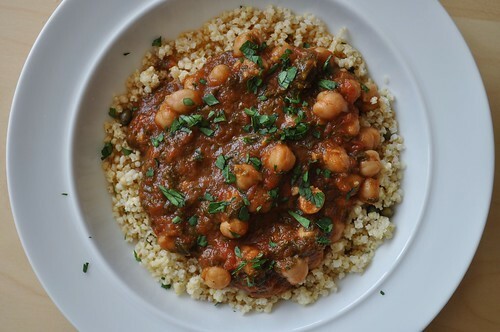 Do not salt the stew prior to this point as it can lengthen the cooking time of your chickpeas. If you are using canned chickpeas, omit the water per the instructions above and bring the stew to a boil. Reduce the heat to medium low and simmer, uncovered, for half an hour to an hour, or until the stew reaches your preferred thickness. Salt to taste. Serve with or without a sprinkling of fresh parsley and a squeeze of lemon juice. Heat the olive oil in a medium saucepan over medium-high heat. Add the millet and toast, stirring frequently, for about 5 minutes. Add the water and bring to a boil. Allow to boil, uncovered, for 2 minutes. Add the capers to the millet. Cover, and reduce heat to low; cook for 25 minutes. Once the millet is done, fluff with a fork and add in the lemon zest and juice, tossing well to combine.